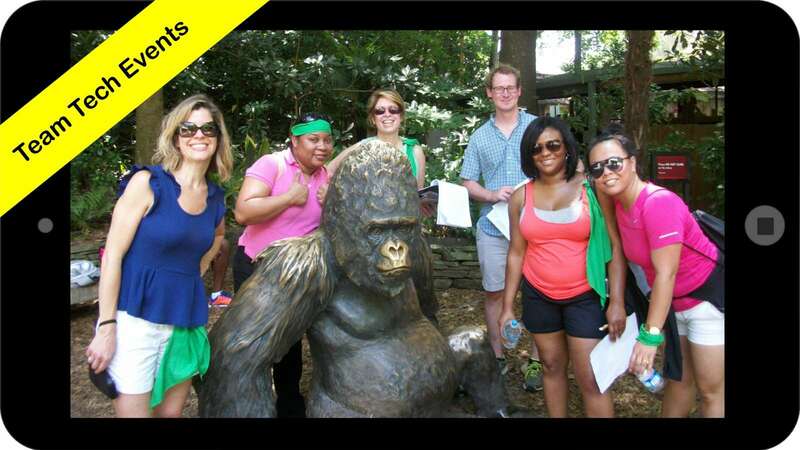 A high-tech scavenger hunt with a wide variety of funchallenges at Zoo Atlanta or the Botanical Gardens. Explore, learn, compete, and have fun in this unique nature scavenger hunt team building. Teams race through Zoo Atlanta or the Botanical Gardens in order to outscore the competition in this fun and fast-paced program. They will solve clues, answer trivia, find hidden challenges, take pictures of their team doing outrageous things, and compete in mini tasks - all with an outdoor theme. This is interactive learning and fun at its best! Welcome & Warm-Ups (5-10 minutes) Our staff welcome the participants to the safari and get everyone ready for a great team scavenger hunt. We then lead some fun warm- up activities that also randomly create small teams. Team Up! (5-10 minutes) Teams take a few moments to create a wild name and slogan for their team, and build some team spirit and unity. Photo Safari: Teams seek out the perfect place to take these team pics, posing with various exhibits, animals and other themed settings. Natural Trivia: Release your inner biologist as you find answers to a wide variety of nature based trivia. Facilitator Challenges: Find an Atlanta Challenge facilitator to earn bonus missions and big points. Brainteasers: Teams test their mental acuity with this assortment of wildlife & nature puzzlers as they travel. Tribe Trivia: Teams seek out interesting information about their team mates, other teams, and anyone else they can find that fits the description they’re seeking. Nature News: Using their app and tablet, teams film amusing video shorts about a range of fun outdoor themed topics and wildlife encounters. Landmarks: Teams have a page full of close-ups of various landmarks to locate in the hunt zone. Scoring (5 minutes) Teams turn in their materials, then the final scores are dramatically revealed. After Party Slideshow If you want to have a more celebrational wrap up to your outdoor scavenger hunt, or just run pictures during dinner, we can provide a website link so you can immediately view photos and videos from your event. Work as a collective force to achieve a common goal. "The entire staff is still talking about the event—the best one we have had in years. I will definitely keep Atlanta Challenge in mind for any future events."